Apparently some1 complained I spoilt the game for them so sorry if that happens but yo shoulda played FF7 by now anyway. If you haven't PLAY IT!!! i do this to a lot of people. xD LAWL!!!!!!!!!!!!!!!!!!!!!!!!!!!! YOur sense of humor is great!!!!!!!!!!! Awesome pic, haha. Sephy is so much better than Cloud! 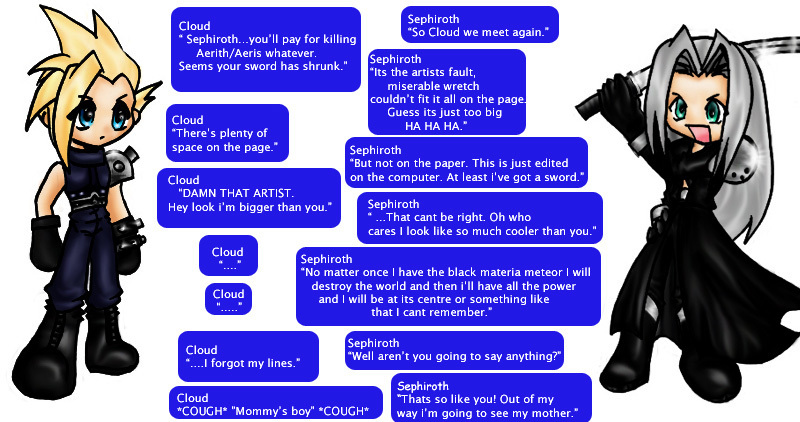 SEPHIROTH FTW!! Wow i love this cloud looks sooooo kool!!! !